I'm a firm believer that working out or exercising is really what you make of it. Based on your outlook and attitude, it can either be an incredibly rewarding experience or absolutely drag-your-feet dreadful. For me, part of semi-enjoying it is loving my gym clothes. When you feel like you look good it makes sweating it out that much better. So I've scouted out some amazing options that play into the neon trend. 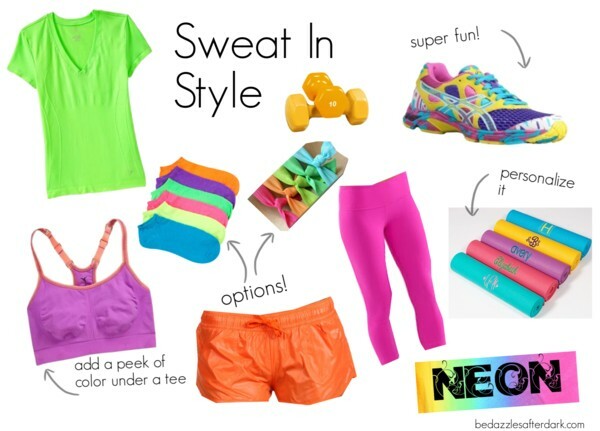 Now, I wouldn't exactly recommend wearing everything at once, but seeing a splash of color on your feet or a flash of boldness in the gym mirror should perk you right up. Pair your bright and bold piece with neutrals (blacks and greys work best) to avoid color overload. Lastly, smile! You may be huffing and puffing your way through your work out, but at least you're doing it! I'm loving the neon trend! Cute pieces!